Today’s “Card of the Day” features some not so rare swordboyz! 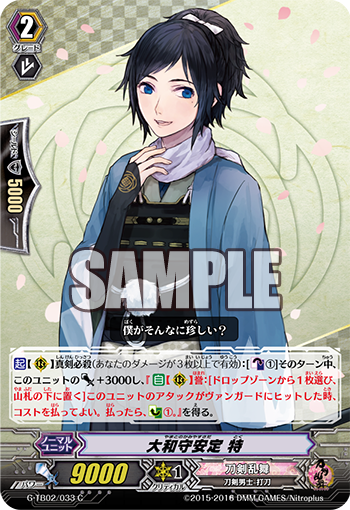 [ACT](RC) Shinken Hissatsu (This ability is active if you have three or more damage):[Counter-Blast 1] Until end of turn, this unit gets [Power] +3000, and “[AUTO](RC) Homare (You can only pay the cost for one Homare ability per turn):[Choose a card from your drop zone, and put it on the bottom of your deck] When this unit’s attack hits a vanguard, you may pay the cost. If you do, [Counter-Charge 1].”. Nitou Kaigan-[AUTO](RC)[Generation Break 1](This ability is active if you have one or more face up G units in total on your (VC) or G zone):[Counter-Blast 1 & Soul-Blast 1] At the end of the battle that a boosted this unit, you may pay the cost. If you do, [Stand] this unit, and this unit gets [Power] +4000 until end of turn.